Before I discovered Paleo I had a long list of food addictions. While many people I have met and talked to have told me that they were bona fide sugar junkies, I’ve never had much of a sweet tooth. But, boy, could I gorge myself crazy on savory things. Chief among my vices were cheese, hummus, crackers… and chips. Worse, I was one of those “the funkier the flavor, the better” type of snackers. Hashtag all the chemicals! I shudder to think about it now, but there you go. As you can imagine, chips or any kind of savory snack don’t appear at my house very often because they’re something that I don’t trust myself to enjoy in any kind of moderation. Recently, I did buy some plantain chips, with the thought that I could experiment with using them as a flour or maybe even a breading. I tasted them when I bought them – and was relieved to find that I didn’t really care for them. So I went ahead and played around with them without worrying. The second time I bought a bag, though? The brand I picked up was so heavily laden with salt it was all I could taste. And although they were salty to the point of unpleasant, they set off my inner carb monster: it turns out that my salt is other people’s sugar. OI. Not fun. I didn’t want to waste them, though, so I figured I’d season them up and see what happened – which is how I came up with these Lemon Garlic Plantain Chips. The lemon juice seemed to neutralize all that excess salt that was overpowering my palate and the garlic rounded things out nicely. When you’re making these Lemon Garlic Plantain Chips, though, you may wish to add some sea salt if the plantain chips you have aren’t aggressively over salted like mine were! Make sure to add the lemon juice just before you put the chips in the oven so that they don’t get soggy. The best part about them for me? They didn’t bring out my inner savory-salt demon! Hurrah! This recipe is Autoimmune Protocol compliant – but, as always, make sure that the plantain chips you use are fried in a healthy oil. Try serving these Lemon Garlic Plantain Chips with my Savory Pumpkin Dip! 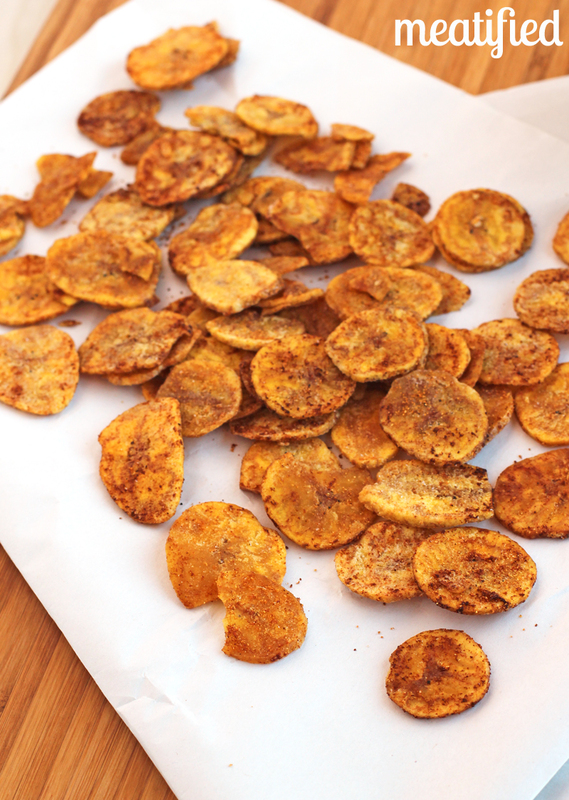 Take your Paleo snacking skills up a notch with these seasoned Lemon Garlic Plantain Chips. All the satisfying crunch you could need and ready for dipping! PREP: Preheat the oven to 350F / 180C. Line a baking tray with a Silpat, foil or parchment paper. SEASON: In a large bowl, add the plantain chips, coconut oil and garlic. Use your hands to gently toss the chips so that they are evenly coated. When the oven is hot, add the lemon juice and stir through the same way. BAKE: Spread the seasoned plantain chips across the lined baking tray. Bake until just beginning to brown, about 8 minutes, then lay out on a paper towel for a minute or so to absorb any excess oil before serving. You may wish to add sea salt to taste, depending on the plantain chips you use and how salty they already are. This recipe is Autoimmune Paleo compliant. hi am a little confused by this recipe…….did you start with raw fresh sliced plantains?? Your wording sounds like you went out and bought plantain chips and added these ingredients? But that makes no sense to me….. Thanks for adding this – this is what I was looking for, too.